Hello guys, hope you are doing good. This is our eight posts in series of RxJava2 Android [ part1, part2, part3, part4, part5, part6, part7 ]. In this part, we are going to discuss Subjects in Rx. First, if you guys have the same issue related to Subjects just like me (that is Observer + Observable )then please try to forget that concept. Now I am going to revise little bit about Observable and Observer. For Observable I will recommend you to revise Dialogue between Rx Observable and a Developer (Me) [ Android RxJava2 ] ( What the hell is this ) Part5 and for Observer I will recommend you to revise Continuation (Observable Marriage Proposal to Observer) of Dialogue between Rx Observable and a Developer (Me) [ Android RxJava2 ] ( What the hell is this ) Part7 . Then you can easily understand my this post. Now I am going to share with you Observable and Observer API below. This is Observable code. Total lines are around 3000 as shown above. As we know Observable always used to change our data into streams by using its different API’s. Below I am giving a simple example. Next, we need the Observer to get benefit from the Observable. Now I am going to show you first Observer API below. As we can see Observer is really simple. Only 4 methods. Now it’s time to use this Observer for our example. * Created by waleed on 09/07/2017. Its output is simple. Now we successfully revised the Observable and Observer API’s. Observable basically call our Observer API’s when we do the subscription. Any time when Observable want to give a data. That always called Observer onNext(data) method. Any time when error occur Observable called onError(e) of Observer method. Any time when a stream is complete Observable called onComplete() of Observer. That is a simple relationship between these two API’s. Now I am going to start our today’s topic. If you guys again have any confusion related to Observable and Observer. Please try to read above-mentioned part of my posts or maybe ask a question in comments. I think a definition of Rx Subject we will discuss in the end. Now I am going to explain you a one more simple example which will make our concept more strong to grasp the concept of Subjects in Rx. This is Observable which will generate an Event String. This is a consumer which will subscribe with Observable. This code will generate an event after every one second. For ease of a reader, I am copying all working code below. This is a really simple example. I think there is no need to explain more. Now interesting part. I am going to make a new example which will give us the same output but using a different technique. Before going into deep. Try to read a code. class ObservableObserver extends Observable<String> implements Observer<String>. That is really simple. I am going to create a new class with name ObservableObserver. Which extend from Observable and implementing Observer. So its mean that will work as an Observable plus as an Observer. I don’t think there is any confusion. So as we already know Observable always generate streams. So this class also has this capability because that extending from Observable. Then we know Observer can observe any stream of Observable by subscribing to that Observable. Our new class also can do that work because that is implementing Observer. BOOM. Now I am going to show you whole code. Which is only for a concept I am not saying that is a MATURE code. Again very simple class. We already worked with above all methods. Only here we have one difference and that is, we are using both Observable and Observer related methods together in the same class. In above code, there are two important lines. Which I am going to explain. Here I am getting Observable from my ObservableObserver class and subscribing to an observer. Here I am using observer API call when an event is generated. That is a RxJava2 Subject class code. Now maybe you can say why people used to say Subject is an Observable plus Observer because that is using both API’s. Now there is a different type of Subjects are available in RxJava. Which we are going to discuss now. In RxJava you will get 4 types of Subjects. Basically, if you run above code you will get the same output for all above Subjects except AsyncSubject. Now it’s time to differentiate between these Subject types. In this type of Subjects. We will get the real-time data. Like one of my Publish Subject emitting data of some sensor. Now if I subscribe to that Subject I will get the latest values only just like as shown below. So here basically publish subject start emitting data from 0 but I am subscribing at the time when that already emitted up to 10. As you can see in output we are getting values from Event 11. In this type of Subjects. We will get the last emitted value + new values which will be emitted by this Subject. For simplicity please check the below code. As you can see in the output. I am also getting ‘Event 10’ value. Which is basically already emitted by that Subject before I subscribe. Its mean if I want the last value or maybe last change before subscribing. I can use this Subject. In this type of Subjects. We will get all emitted values without taking tension of when I am subscribing. For simplicity please check code. Now again I am subscribing to event 10 but I am getting all history. So that is simple. In this type of Subject. We will get the last emitted value, which is emitted by a Subject before completion or termination. For simplicity check below example. Here as you can see I completed my subject at value 10 and after that program is finished but before exiting the program I got output value Event 10. So its mean any time where I want to get last emitted value of a Subject I will use Async Subject. Publish Subject: I don’t care about the previous history of emissions. Only I care about new or latest values. Behaviour Subject: I care for the last value which is emitted by this Subject and the new values. Replay Subject: I care about all the history of emissions with new values. Async Subject: I care only the last value which will be emitted by the subject before going to complete or terminate. Hello Friends. Hope everything is clear up to this point. Only try your best to do a hands-on practice of all these concepts. For now, I want to say Bye and have a nice weekend. 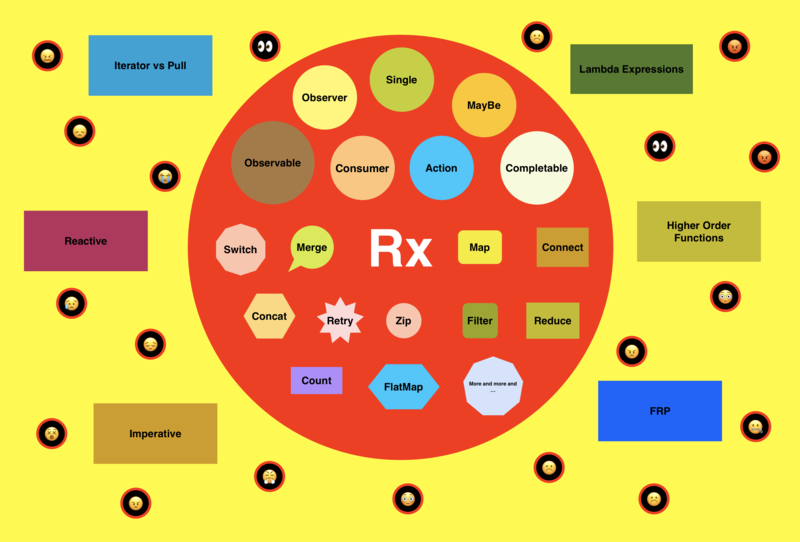 Reactive Programming (What the hell is this )[Rx | Java | Android ] Season 2 is available now. thanks, a great help to me!!! This is one of the best tutorials out there. Apart from some funny sounding sentences, it is excellent. I highly recommend you to revise these errors, and “re-advertise” it. This will be a hit. Again loved it. Thanks a lot. Thank you for your appreciation & suggestion. I am working on my writing skills but will take time :).